Getting a later start than most has not stopped Mark White from pursuing a successful racing career. He acted on a life-long dream in the fall of 2003 when he attended the Skip Barber Racing School at Road America, 100 miles from his hometown of Madison, WI. In 2004, that dream quickly escalated from a strong interest to a focused passion as Mark promptly started racing and winning within the Porsche Club of America. "My first class win occurred at Laguna Seca. Talk about a life-changing experience. I always had the desire to race... now I was driven to!" 2005 added fuel to the fire as Mark also began campaigning a D Sports Racer resulting in an impressive combined record of 21 wins in SCCA, PCA and NASA. In 2006 Mark founded Accumoto Motorsport, a race prep and support shop primarily focused on the newly formed ALMS IMSA Lites series. Establishing a solid record of 5 podiums in 8 starts, Mark finished fifth in his rookie year in the L2 championship. 2007 brought continued success in IMSA Lites as Mark finished 2nd in the L2 championship accumulating multiple milestones along the way. The list of achievements include lap records at Lime Rock Park, Mosport, Road Atlanta, and Laguna Seca. The most impressive statistic however, is a staggering eleven podiums out of twelve starts,... with an astounding four wins in the rain! Mark's speed and consistency also resulted in the opportunity to move into the Rolex Grand American Sports Car Series where he piloted the # 28 Porsche GT3Cup with Ian Baas for At Speed Motorsports in the GT Class. 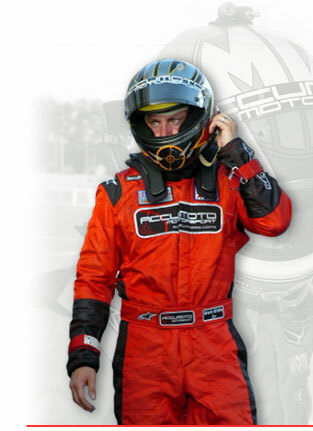 In 2008 Mark was signed by APR Motorsport, teaming up with multiple sports car championship winner, Randy Pobst. Mark, Randy and guest driver Sabine Schmitz campaigned the #181 VW GTI in the ST class of the KONI Challenge Series. Mark continued to excel, delivering two top ten results, punctuated by four top 5 qualifying efforts and standing at the head of the time sheets with fast laps at Mid Ohio and Watkins Glen. 2009 saw Mark return to the ST class of the Grand Am KONI Challenge Series. He was signed for the full season by Freedom Autosport to pilot the bright green #147 Mazda MX5 with co-driver Sarah Cattaneo resulting in multiple top-10 finishes. 2010 finds Mark back in Grand-Am, racing in the Continental Sports Car Challenge. He is excited to once again drive for APR Motorsport as he and former teammate Ian Baas join forces to unveil the brand new #01 Audi B8 S4 in the Grand Sport class of the series. His enthusiasm for the sport also finds him at racetracks throughout the country as he fulfills many guest and private coaching obligations. He enjoys ongoing relationships with numerous organizations including Prairie Hills Motorsports Club, The Audi Club of North America, The BMW Car Club of America, The Porsche Club of America, Chin Motorsports, TrackDaze and APR.